You can use Menu, Toolbar and Ribbon components as a menu bar and attach them to the top of a cell. 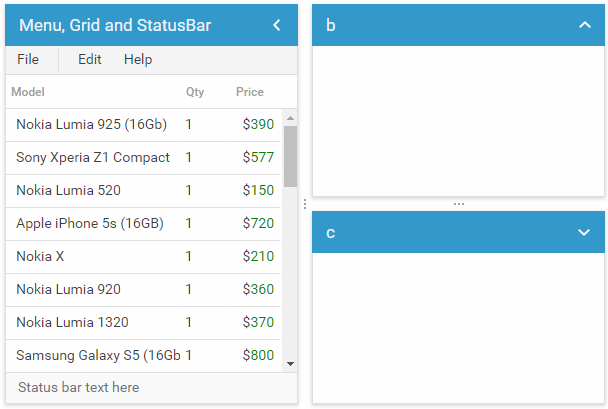 A cell can also have a simple status bar at the bottom added with the help of the StatusBar component. You can attach several of these components at a time together with other content of a Layout-based component. 3) Learn more about dhtmlxMenu from the related documentation. 3) Learn more about dhtmlxToolbar from the related documentation. 3) Learn more about dhtmlxRibbon from the related documentation. 1) There's no need to include extra .js/.css files.